Aaah, love these picks, especially the Vince dress and striped shirt! 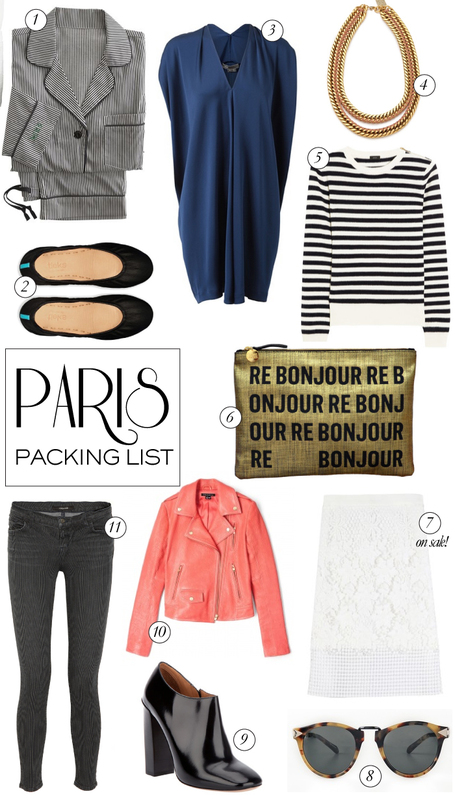 Such a Parisian vibe that looks so much like my daily uniform in NYC! That theory jacket are what dreams are made of! I have that melon Theory jacket and LOVE it! Great choices. Have fun in Paris! Les Ombres is a wonderful restaurant atop the Branley museum overlooking the Eiffel Tower (which now twinkles every 10 minutes since the millennium). Book a table soon though. A sought-after restaurant! I went a couple of years ago with my husband, who had a business trip. It was my first time back since before we met, when I spent two weeks there and almost moved there. Since we were only there a couple of days for his meetings, I took a large, empty suitcase and stimulated the French economy for several hours. Had a “shopping map” (had planned my route) and spent several hours in Printemps! Enjoy your trip, Merritt (and other posters too)!! Of all the places I’ve been, Paris is my most favorite city on earth. Oh! And don’t forget…the museums are closed on Mondays, so plan your schedules accordingly! I am so jealous you are going to Paris! I lived in Nice, France in junior high and miss it so much! Have fun!